What's the Difference Between an Airsoft Gun and a BB Gun? Airsoft guns and BB guns are very popular gifts for both girls and boys while they grow up. Generally, they are given so that the child can learn about guns, without having something too dangerous in their hands. It also is a lot of fun for children and adults alike to target shoot with these guns. But when talking about airsoft or BB guns, most people tend to group them together as though there is not a difference. Some people tend to think that they are the same guns but just with different names. However, this could not be further from the truth. Sometimes people will seem to notice that they are two separate guns but will confuse the names. In many cases parents, and even news reporters, will call them Airsoft BB's or Airsoft BB guns. So that everyone is on the same page and has a clear understanding of what these guns are, it is important to clear the air of any confusion may be floating around about these two guns. The airsoft gun may be somewhat similar to the more traditional BB guns but there are very unique differences. One thing that is very noticeable with the airsoft gun is that it appears to be the real thing from a distance. Not only do these guns appear to be something that is much more powerful and dangerous but they are often times exact replicas of various real guns. Some even have the same kind of manufacturer markings on them along with being about the same weight. Because of the realism of the airsoft guns, these are generally very popular with those who are military enthusiasts. Also, it makes a great gift for someone who likes a particular kind of gun but is unable to get it. The pellets are shot out from the airsoft gun by a force that will vary depending on the exact airsoft gun you are looking at. Some are powered by gas or are manual spring loaded. Other airsoft guns function from the help of compressed air or an electrically powered gearbox. With so many styles and options to pick from, a person could quickly and easily build themselves a nice collection of airsoft guns! So What Is A BB Gun? This is an air-powered gun that shoots round or sometimes pointed pellets that are made of metal. BB Guns shoot farther and faster than the airsoft gun and are typically used for hunting (birds, etc). 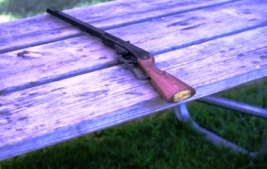 The most famous of the BB guns would be that of the Red Ryder BB gun, which was first sold to the public in 1938 and were for some time sold as "toys". The typical BB gun is sold as a rifle or a pistol and there are not too many designs or options to pick from. Why Do People Confuse These Two Types of Air Guns? For one thing - the BB gun certainly came on the market first and everyone is used to the concept of this gun already. Many more people have heard of the BB gun, before they've heard of Airsoft, no doubt. The general understanding that air is the main source in a BB gun is probably one reason why people assume that the airsoft gun is the same thing since the word "air" is in the name. Both guns also use a type of BB for shooting, so the term 'BB' are also known and associated for either gun. Also, the pellets for both guns are round, even though they are made out of different materials. The confusion between the two guns generally comes from a lack of education in air guns. Once people are taught the difference they can easily see what makes each gun different and unique. Airsoft Differences in BB Gun Types of Ammo Used? The airsoft gun shoots out plastic round pellets. These are normally 6mm or 8 mm in diameter, which come in a variety of weights. The weights typically range from 0.12 to 0.88 grams. The heavier the weight, the harder the impact (or hit) is. Generally, a 0.2 or 0.25 gram weighted plastic pellet is used. This is because it has been known to get the best range and accuracy. The great thing about this Airsoft ammo is that it was designed to be non-lethal. The BB gun has ammo that is made from steel, which is plated in copper or zinc so that there is no corrosion. The ammo piece also measures at 4.34mm to 4.39mm in diameter. There are some plastic BBs on the market that were made by Asian companies for recreation. Is One Gun Safer Than The Other? The airsoft gun is by far much safer than the BB gun. The BB gun shoots its ammo much faster and this specific ammunition is made with materials that will pierce the skin. With the "right" ammo, placement, and speed; the BB gun's pellets can kill humans and animals. BB gun ammo is also highly known for ricocheting. The soft plastic that is used as ammo in the airsoft gun will not kill anyone. Generally and currently, airsoft guns are much more popular than the more traditional BB guns because of their look and their safety. Canada and the United Kingdom are among the few areas that have expressed a lot of concern regarding the BB gun, since it can in fact kill people. In most cases, especially that of the United States, the BB gun is not considered a firearm and therefore most teens are allowed to legally carry them. There are no permits needed for teens or adults. Children (younger than teenagers) using Airsoft guns, should be closely supervised and immediately be taught safety measures in handling their Airsoft guns. What Is The Typical Cost Of Each? The cost for the typical airsoft gun and the BB gun will vary depending on where you are making your purchase and the exact model that you are getting. Each have a wide variety of choices to pick from, with the airsoft gun of course having the most. You could easily spend a hundred or two for either one of these types of air guns. It is generally recommended to start cheaper though, for those who are just getting started in airsoft or bb guns. Those who have a passion for target shooting and collecting may want to look at airsoft guns and BB guns that are more expensive (as in realism and durable quality) than typical airsoft or bb guns. In the end - it's all depends on the size you want, why (intentions) you want it/them, the model you want, and of course - the quality! Typically, adults prefer the BB guns for target practice and the airsoft guns for intense army games with friends; as they can be shot at without the worry of killing or injuring someone. If you are interested in picking up something along these lines for your child, you may want to stick with the airsoft guns. Even though they may love the BB guns, they are simply too dangerous for children who have not yet learned extensively about gun safety. It takes a lot of knowledge, training, practice, and maturity to handle a BB gun. Even then, accidents happen, so it is important to be sure that you are making the appropriate choice. 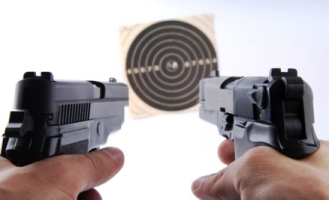 If you are unsure about which type of gun between the two that you should go for, try them out for yourself. Be certain to first practice with a BB gun and an airsoft gun that you can borrow from a friend. This is a great way to learn a lot of detailed information about specific gun models from the companies that sell them and the manufacturers that make them. Also, you will be able to learn a lot through the experiences of people throughout the world that have owned them. By learning as much information as you can before you spend your hard earned money you will be sure to end up with the right BB gun or airsoft gun for you. See the Beretta Elite II Air Pistol Review from users who own this gun, by clicking the link and then scrolling to near the bottom of the page to see customer reviews on this product, for example. There is definitely a lot to learn from others who are kind enough to leave positive notes and tactful criticisms. Click the link above to get the feel for it! If you'd like for us to review a particular airsoft or bb gun, simply ask us, by clicking here. Best wishes on finding that perfect BB or Airsoft gun!